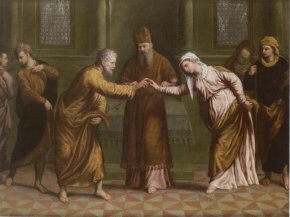 3/7/08 — Acquisition — Caen, Musée des Beaux-Arts — The museum in Normandy pre-empted a painting by Paris Bordone representing the Marriage of the Virgin (ill.) last 18 June during the auction by Millon & Associés for 55,764€ (including fees). Caen, which holds a very rich collection of 16th century Venitian paintings (Tintoretto, Veronese, Sustris…) already owns a masterpiece by Bordone, The Annunciation. This latest acquisition thus further emphasizes one of the museum’s strong points which had led it to organize in 2005 (with Bordeaux) the recent exhibition, Splendeur de Venise (see article in French). The museum is also one of the rare French establishments that still continues to acquire Italian paintings (see news item, in French, of 15/04/05). In 1995, Rennes had purchased another Bordone, Saint John the Baptist Crowning the Lamb with Flowers. Paris Bordone, according to Vasari, was in France in 1538 but this date is debatable. He may have made a second trip there some twenty years later. The catalogue for the Millon sale suggested a date around 1540 for the painting, perhaps during his stay in France, and very pertinently linked it to a painting at the National Gallery in London representing Christ Baptizing Saint John Martyr. This painting will join another very famous Marriage of the Virgin in Caen, by Perugino.